Burmese Tea Leaf Salad – Plated for presentation but not yet mixed together. So, if you are just joining us, you may want to read Part 1 of this blog post describing how to pickle your green tea leaves. For those of you who already read and now want to eat, we have a few more steps to finalize this salad. This salad is traditionally served with the tea leaves acting as the equivalent of lettuce, which I will prepare below. However, the pickled leaves remind me more of a dressing and do nicely as a garnish on romaine lettuce. So feel free to Americanize. Paper towels and four plates. Cast iron frying pan or a pan with high sides to fry in. You will also need a ladle to pull out the lentils and a slotted spoon for the garlic. Start by gathering up all your ingredients as the frying times are going to be short and you cannot walk away from the pan. Setup the paper towels on two of the plates, double the paper towels on one of the plates for the lentils. This will give you a place to put the ingredients to cool before plating them with the tea leaves. Remove the skin and slice the garlic cloves. Cut the tomatoes into wedges to get you at least 4 wedges per serving. Empty the lentils out of the can into a strainer and rise under cool water. Pat dry with paper towels. Put the pan on the stove top and allow to heat. Add the sesame seeds and allow to toast for no longer than about 1 minute. If they start to turn brown on you remove from the heat so they do not burn. Pour the sesame seeds out on one of the plates with no paper towels. Next, put the peanuts into the pan and toast them for about 2 minutes. You need to stir the peanuts to prevent burning. You will smell the peanuts, which is an indicator to remove from the heat as they will burn quickly after this point. Pour the peanuts out on a plate without the paper towels to cool. Now add oil to the pan, depending on your oil type it will ripple immediately and will not require any more time before putting in the garlic. The garlic will cause bubbling, so do be careful. You can lower the heat and stir the garlic with a slotted spoon. It will take the garlic about 5 minutes to start to turn brown. Once brown, remove from the oil and put on one of the plates with paper towels to remove the oil off the garlic. Next, put in the lentils, leave them in the oil until they are crunchy, which will take around 5-7 minutes. Keep stirring and you will feel as they dry out and harden. Remove them from the oil. Unfortunately, the lentils are so small they fall through the slots in the spoon. So you will need to remove them with a ladle. Measure out roughly 1/2 cup of the tea leaves into the middle of each of the 4 plates. 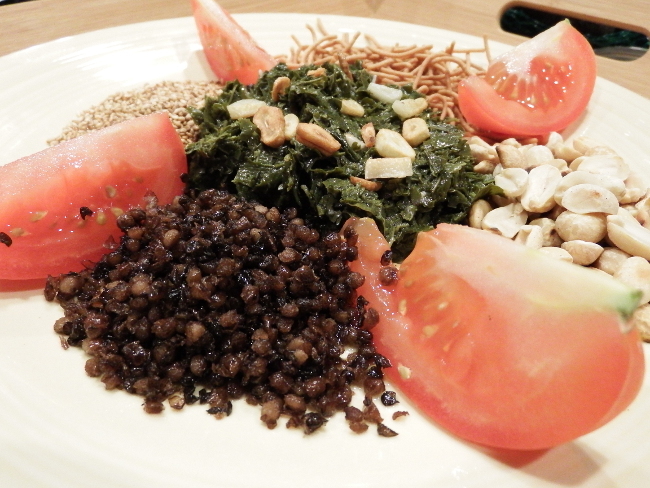 Arrange the dry ingredients (rice noodles, fried lentils, sesame seeds & peanuts) in piles around the outside of the leaves and divide the piles with the tomato wedges. Sprinkle the garlic on the top of the tea leaves. It is up to the individual to decide how they would like to mix the ingredients together. Don’t skip the fried garlic and lentils as they add a wonderful textural contrast to the tea leaves. Herbs, spices, flower petals, and more can be used to create your own tea blend. 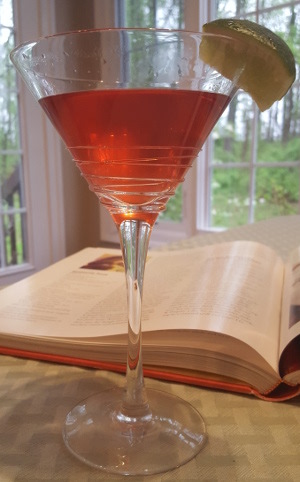 Making your own tea blends is a fun way to play with your tea and allow you to make a one-of-a-kind creation for yourself or for a special event. 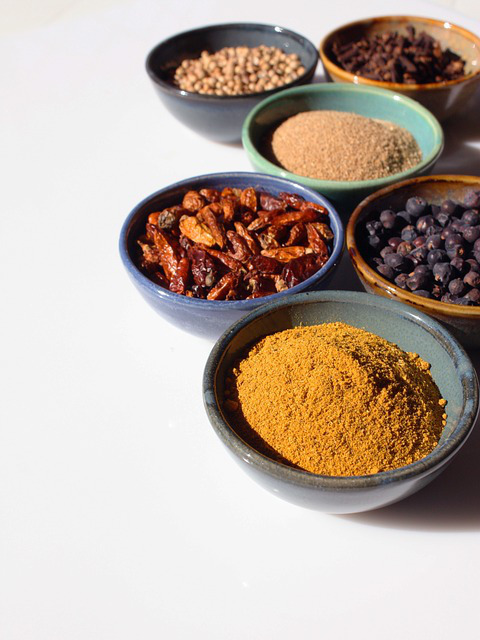 Before pulling out all the spices you can find, you should keep in mind the following. Bad tea is bad tea. No matter how good your spicing or flower mix is, it cannot cover up bad tea. If you want a good tasting blend, you need to start with good quality tea. If you are contemplating blending to try to use a tea you do not like or tastes slightly off, put those tea leaves in your flower bed or compost pile, your plants will love you and you do not have to drink bad tea. Less is more. 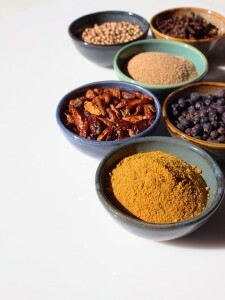 When working with spices and herbs like cinnamon, mint, or lavender, a little bit goes a long way. Tea is hygroscopic, which means it absorbs all odors in the air. It only takes thirty mints of exposure to mint, that is just sitting next to it on the counter, for mint flavor to appear in your tea, adding that to the spice itself amplifies its effect. Start with these spices and herbs at 1/8-1/4 of a teaspoon per ounce of tea and work your way up to a flavor profile you like. Work in small batches. Black tea can have a three year shelf life, but few additives can last that long. If you are making a blend, work with no more than 2 ounces of tea, which makes thirty cups. Use dried or fresh edible flowers, but brew them first by themselves. To brew them by themselves, you will want about 1 gram to 1 ounce of water, bring the water to a boil and steep for 5 minutes. Sorry, but a scale is necessary when handling flower petals, there is no direct conversion to teaspoons as their weights vary dramatically. This will mimic what will happen when it is in the tea and give you an idea of what flavor it can add to the mix. Dried flowers, like calendula (marigold) are frequently added to tea for their appearance but they have their own flavor. By itself, calendula tastes like leather, but in a tea it adds depth and a full mouth feel. Keep in mind number 3 when working with flowers as well. Size of ingredients matter if you are planning to store the tea. Small ingredients will fall to the bottom of your container, if you size the ingredients to the size of the tea you have a better chance of it remaining blended evenly while in storage. If that isn’t possible, you will want to pour out the dried tea, stir and then scoop out what you need to brew a cup or pot. 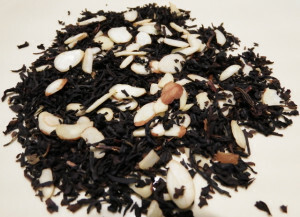 We have several tea blend recipes for you to play with including Almond Tea, Kashmiri Chai, and Masala Chai. Almond tea is becoming harder find, and that is not surprising. 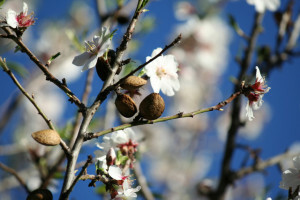 Most almonds in the United States are grown in California, which is suffering from a record drought. Like any orchard crop that requires water, when it doesn’t get enough it will not produce enough high quality final product. This sends the cost sky rocketing, making it harder for for industries that use almonds as an ingredient to keep their costs in line with what consumers expect. Adding higher cost to an ingredient that dramatically cuts the shelf life of your end tea product already, and eliminating almond tea makes good economic sense for most high quality tea producers. However, that doesn’t mean an end consumer cannot make their own almond tea in smaller batches to enjoy at home. Before we get to the recipe,there are a few things you need to know about almonds. Nuts and tea have very different self lives making it very tricky for a tea blender to come up with a high quality product, in a quantity that is cost effective, that features a nut as the main flavor component of the tea. Most nuts, once cut or crushed start to release their oils and in return take in air, moisture, and bacteria, which starts the spoiling process. Almonds are usually only good for two months, under the best storage conditions, once they have been cut. If you are blending that with a tea that is good for 24 to 36 months you have effectively killed the shelf life of your tea. So to ensure a good quality flavor and try to keep your tea from going rancid because of the nuts, extracts are used to apply the majority of the flavor. In fact, if you look at most teas with a nut like flavor, you will not find nuts in them, but extracts and flavors, which bring out the nut taste. Citric acid and other preservatives can be applied to the nuts to slow the degradation, but that is very tricky in tea as the boiling water will release the preservatives, usually causing a bitter flavor. Now, at home, the use of preservatives is not necessary as you will be making smaller batches that are not traveling to various stores and sitting in storage for who knows how long before being consumed. So we will use a combination of extract and almond pieces to make our tea recipe. Almonds have a very subtle flavor, which usually comes out bolder when toasted or cooked. So you would think boiling an almond would help bring out more flavor, but it doesn’t. To really get an almond flavor after applying boiling water, you need extract. Just putting in almond pieces will not get you the flavor you are after. When blending tea, we are constantly worried about the size and shapes of ingredients so that they all balance together to distribute evenly in the bag that is going to be shipped and stored in fashions out of our control. So we have the ingredients cut to the right size to complement the size of the tea leaves being used. At home, this may not be much of a concern to you but if you care about the almonds being distributed in your tea evenly you will want to follow our instructions on creating the almond meal instead of just using the sliced almonds. If even distribution does not bother you, then free to use larger almond pieces. This recipe is geared to get you 15 cups of tea. If you do not think that is enough, you can double this recipe, but don’t go too large as the almonds will only keep for maybe 1 to 2 months (Do you really know how old that almond is you just bought off the shelf?). 2 oz of tea is about 30 cups or 1 months worth if you drink a cup every day. For easier grinding, lightly heat the almond pieces in a dry cast iron pan. You can leave them in their long enough to toast them, but really you are just warming them up. Be careful not to burn them as it will ruin the tea. For even distribution of the almonds, buy slivered almonds and put the warmed almonds and extract into a mortar and pestle and grind down until it looks like corn meal. Scrape into a glass jar (quart size or larger) or ziplock bag and then add the tea. Shake until everything looks evenly distributed. Pour the tea out onto wax paper and allow to dry at least 12 hours. At first this is going to have a very heavy alcohol smell from the extract. Don’t worry, as it dries that will disappear. You will notice after a few hours the smell gets smoother and more almond like. You can then put the tea back into the sealed bag, glass jar or air tight container, remember to keep it in the dark. If you need to speed up the drying process, you can use a dehydrator at its lowest setting for about 1 hour, check every 20 minutes as you run the risk of burning the tea. You will brew this like any other tea. 1 teaspoon or 3 grams per 8 ounces of water, steep in boiling water for up to 5 minutes. Don’t be surprised if it is a little cloudy, that is the oil for the ground almonds. Now that you have a base recipe for almond tea, you can get creative and try it with other subtle flavored teas like Vanilla Yunnan. Enjoy your new tea and don’t forget to drink it more frequently so it is gone before the almonds go bad! After writing the prior blog on tea parties, I started looking at different recipes for cookies that are typically served with tea. 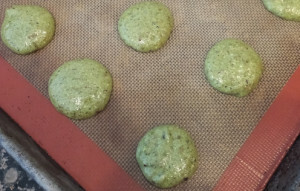 Macaroons are mentioned, so I thought it would be fun to use Matcha instead of the green food coloring typically used in Pistachio Macaroons to make Matcha Macaroons. A traditional macaroon always contains nuts, usually almonds or pistachios. I was surprised to find that the matcha and pistachios got along just fine when it came to flavor. I filled these with chocolate buttercream to help soften the green tea taste of the cookies. However, you can make whatever buttercream filing you like to put in the middle of the cookies. Grind the pistachios, powdered sugar and food processors until the nuts are as fine as the powdered sugar. You may need to stop and scrap the bowl down a couple of times to ensure you got as much of the nut pieces as small as possible. In a metal bowl, whisk the egg whites until fairly stiff and then dust them with the tablespoon of sugar. Then whisk until very stiff peeks forms. Fold into the egg whites the nut mixture about a quarter cup at a time. If the oil from the nuts causes the sugar to clump, just run the mixture through a sifter as you add it to the eggs to separate it. The mixture should be fully incorporated with the egg whites. Pipe the mixture onto cookie sheets to get round circles. You will need either greased parchment paper or Siltpad in order to keep the cookies from sticking to the baking pan. The goal is to get an even number of cookies that are relatively the same size so we can incorporate the filling. If you do not have a piping bag and tips, just cut the corner off a ziplock bag and use that. They will not be as perfect, but still nicely round. You should get around 24-30 cookies depending on how big you make them. Bake for 8-12 minutes at 350 degrees Fahrenheit. Remove from oven and allow to cool on tray above a wire rack for at least 10 minutes before handling. 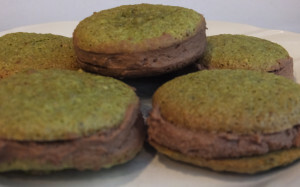 To make the filing, using an electric mixer beat the butter until pail and then add in the chocolate followed by the matcha and powdered sugar. The mixture will start to lighten in color and expand in the bowl as the sugar is incorporated. In judging whether to add additional sugar, look at the shininess of the cream and don’t be afraid to stop the blend and take a small taste. The filing needs to stay creamy, hold its form on the spoon (turn the spoon up-side down, if it starts to drop immediately you need more sugar) and not feel grainy on the tongue, which will happen if there is too much sugar added. The filling can either be spooned onto the bottom of one cookie or piped on with an icing bag if you would like precision. An icing knife or straight edge can clean up the edges for you. Add around 1/2 tablespoon of the filing. Of course you can add more, it just may squeeze out the sides and become a bit messy when you bite in. (My six year old thinks this is one of the better features of this cookie). This will make somewhere around 12-15 cookies.